According to the Way of Men, the four defining masculine virtues are strength, courage, mastery, and honour. As the foundations of masculinity, I am going to link these virtues to scripture and the Christian life as a basis for Christian masculinity. Today I will focus on courage. A hallmark, the hallmark, of Christian masculinity is fearlessness. A Christian man should have faith in God that He will meet his needs. From this faith the Christian man should develop a fearlessness to the world around him, for if God’s got your back, what else could there possibly be to worry about? There is nothing earthly worthy of fear and of the otherworldly entities worthy of fear, one is our leader and the other has already been defeated. There is nothing to fear. Our courage, our fearlessness is grounded in our faith in God. A Christian man who lets fear control his actions or thoughts is failing in his faith and needs to renew his faith. The Christian beta is not nice, he is not humble, he is lacking faith. He is guided by fear. He lacks confidence because he lacks the faith God is with him. He is “nice” instead of honest because he lacks faith in the truth. He is afraid to approach the cute girl at church because he lacks the faith God is in control. He worries of other’s opinons because he lacks the faith God’s opinion is the only one that truly matters. He doesn’t stand up for what he knows is right because he lacks faith in his godly convictions. He is desperate because he does not have faith in God’s plan for his life. He doesn’t take risks because he doesn’t have faith God will protect him. He refuses to lead his wife because he doesn’t have faith in God’s plan for marriage. He is afraid to chase his godly desires because he lacks faith God will provide. These passive, beta behaviours do not come from any sort of holy motives, but from fear born out of a a lack of faith. He should have no fear for he already knows the final destiny of his soul, and all else is simply temporal detail. The Christian man needs to replace his fear with limitless confidence born of faith. The confidence of secular game comes from pride. The PUA has irrational self-confidence for he’s basing his confidence on his own self, which is limited. It is irrational because he thinks to highly of himself. Hence the need for the PUA to always remind himself to maintain frame. He has created an irrational bubble of self-confidence that is not based on reality. If he fails to maintain frame, the false front of his irrational self-confidence becomes clear. The confidence of the Christian man should come from a fearlessness grounded in faith in a limitless God. Once he has it, it can never be taken away, for it is based in the reality that God is in control and His control is absolute. There are no limits to his confidence because God is limitless. His frame is unbreakable for it is fully rational and is based on the unconquerable Almighty. The first step of developing yourself as a man is to recognize where you lack faith. Any place where you fear, you are lacking faith. So ask yourself, what do you fear? Of whom are you afraid? When do you let fear control you? The second step is conquering your fear by developing faith. Recognize that God is in control. Afraid of approaching that girl? Have faith. Overcome your fear and approach her. If God means her to be yours, you can’t fail. If it doesn’t work out, God never meant her to be your wife, so it is well. Don’t know what to say? Have faith. If success is necessary, God will provide any words needed; simply start talking and say whatever comes to mind. Are you lowering your standards for a woman out of desperation? Have faith. If you are meant to be married, God will provide. If you are not, marrying a low quality girl will lead to your destruction. Are you afraid of your wife and letting her control your marriage? Have faith in God’s plan for marriage and take your rightful place as head of the family. No matter what you fear, remember that it is nothing next to the God who is with you. Know that faith is an active process, not a passive process. When I say have faith, I do not mean you should avoid acting or wait passively. Having faith means giving yourself to action. When I say God will provide, I don’t mean you should simply let life slip by waiting. I mean that God will give you the strength to take what you need. Many churches and Christians make the error of mistaking non-action for faith, especially in the realm of marriage. The advice to wait on the Lord to provide a spouse is horrible, possibly even sinful, when used incorrectly, as many Christians do. Having faith that God will provide a spouse, means having the courage to act fearlessly in pursuing one. It means having the faith in God to strengthen you while you improve yourself as a man to be worthy of the wife God will provide you. If you are a woman, having faith the Lord will provide does not mean simply praying and hoping. It means actively preparing yourself for marriage by developing your womanhood. It means actively putting yourself out there for godly men to pursue. And what more shall I say? For time would fail me to tell of Gideon, Barak, Samson, Jephthah, of David and Samuel and the prophets—who through faith conquered kingdoms, enforced justice, obtained promises, stopped the mouths of lions, quenched the power of fire, escaped the edge of the sword, were made strong out of weakness, became mighty in war, put foreign armies to flight. Women received back their dead by resurrection. Some were tortured, refusing to accept release, so that they might rise again to a better life. Others suffered mocking and flogging, and even chains and imprisonment. They were stoned, they were sawn in two, they were killed with the sword. They went about in skins of sheep and goats, destitute, afflicted, mistreated—of whom the world was not worthy—wandering about in deserts and mountains, and in dens and caves of the earth. This entry was posted on Sunday, February 9th, 2014 at 00:00	and tagged with Beta, Christian Masculinity, Courage, Faith, Hebrews, Matthew, PUA, The Way of Man, Virtue and posted in Christian Masculinity, Christianity, Game, Relationships, Virtue. You can follow any responses to this entry through the RSS 2.0 feed. “To have faith is to act without fear”. Is faith not Trust in the Father despite of having fear? Is faith in the Father despite having fear not bravery? Is bravery not perhaps the Hallmark of a Christian man? Excellent post FN. Looking forward to the others. Will comment in length when I get a chance. Indeed. The answer to your prayers is given while you are in action, not while you are talking. I love it when Christians frame useful truths in terms of their religion. Christianity love of the truth is it’s most admirable trait. Good words of encouragement. For Tom Smith, read how Rebecca was chosen as wife for Issac, though neither had seen the other. Was their married life perfect? No, but that was up to them. Don’t be afraid of “what,exactly” I think it is that second half of Heb 11:32ff that causes most to pause. I look forward to you next in this series. I like where you’re going with this. I thoroughly enjoyed Way of Men, and am curious to see where you go with the rest of it. The Christian virtues are very specific things, you might start confusion if you start this series by taking non-christian descriptions under the label of virtue and look at them under a Christian light. For example, Courage falls under the virtue of Fortitude yet, as you noted, requires a great deal of the three Theological Virtues. Particularly those of Faith and Hope in the examples you gave, though certainly guided by Charity as well. Obviously, I don’t know what you’re planning on doing with the rest of the series. I merely don’t want words, terminology, and semantics to get in the way should you be pursuing the Christian virtues while talking about what Donovan called the masculine virtues. 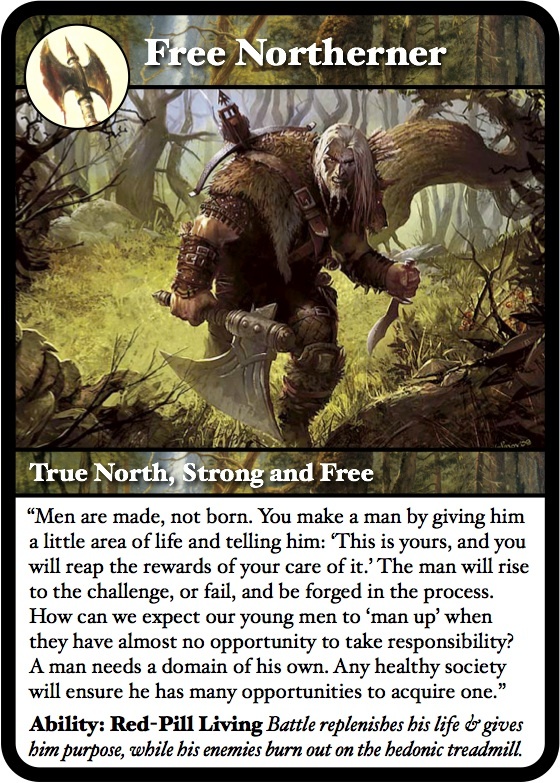 Avoiding that confusion was why I wrote the post on aspects of masculinity separate from the virtues; so that each could be describe clearly as I’ll be talking about each in the future. Bobbye — You make it sound as if all we have to do is say some prayers and our girl will appear before us. This doesn’t sound manly. Interesting take on Christian Masculinity. There are so many coaches in the PUA community talking or writing about how to overcome Approach Anxiety. But one thing no one ever mentioned is prayer. Prayer definitely helps with “Inner Game”. Of course, I’m aware most coaches aren’t Christian. But it’s good to notice a few Christian Voices in Modern Masculinity.